Solar Capital De Aar 3, in collaboration with Learn2Live and the Karoo Eisteddfod Trust, conducted Teacher and Parents Awareness Training in De Aar for the week of 7 – 11 November. The training focused on inspiring teachers to grow their créche’s as successful learning centres, as well as implementing the national curriculum successfully. The parent training aspect revolved around promoting a healthy family life. All parents were invited to attend the free information sessions on the evenings of 8 November and 9 November at Khazimla – Centre of Excellence. The training was be offered in isiXhosa and Afrikaans. 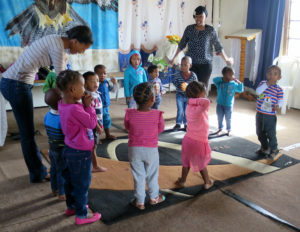 Solid Early Childhood Development (ECD) at crèche, as well as a stable family life, lead to the development of the child on a physical, cognitive, social, emotional, perceptual, as well as moral and spiritual level. Further ECD training will take place next year.